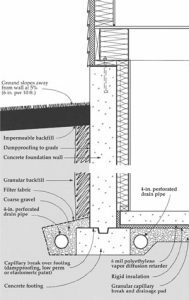 As we mentioned earlier on the page covering foundation materials, many of the design decisions made about the foundation are involved with insuring that water will not be able to penetrate the basement interior. The material selected is important in this regard but the drainage design is even more important. Drainage designs can vary from extensive interior and exterior loops of drain tile or piping to no drainage at all. The image to the right represents a house that has included an interior loop of drain tile which terminates in a sump pit. Water is thereby channeled to the pit and then pumped from the house. The inclusion of the interior drainage loop allows the builder to use sand or gravel and still insure that water can be moved away from the structure before it enters the basement. So, what is the solution? There actually is no ideal solution. Every builder, every homeowner has to walk a delicate balance between risking a very costly water problem and less expensive potential radon problem.